What did Ezekiel mean by saying that his message of woes was like honey and sweetness to him? Why did Amos pronounce woe to those in his day who desired the Day of the Lord? Did Isaiah say that God actually creates evil? Dr. Sproul answers these and other questions by interpreting the passages in light of their contexts and the whole counsel of God. 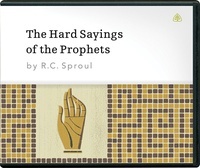 This series can help Christians work through the hard sayings of the prophets, finding in their words not confusion but timeless principles from which we may benefit today. An altogether deep-seated exploration into the full volition of God's truth revealed within His word through the Prophets.